I've always felt it was a shame that Cameron couldn't have built his entire film on it. Yes! Exactly! I mean, I know you already know how I feel about this (and I don't hate Cameron's film but I don't like the whole thing either. I like exactly what you like about it but feel it's enough to give the whole film a 51% instead of a 49%) but it's still good to see you found it so good. It's just an excellent movie, period and the best Titanic movie hands down. I wrote that almost three years ago (my second most popular post ever, it still gets about 200 plus hits a day) in a post on History and the Movies at Cinema Styles and I stand by it. I've seen it a good five or six times and it holds up every time. What a great movie. If I ever get a blu-ray player, I'll buy it. I didn't get the Blu-Ray myself (confidentially, outside of a few movies, I have yet to see big draw), but I'm very glad I finally watched it. I would have said more, but I felt so under the gun writing this. Whatever, though, it's a great movie. But one thing I didn't get into, and didn't get into by choice, is...look. Cameron's movie. I know it and A NIGHT TO REMEMBER are based on the same historical facts, and I am not at all any kind of scholar on the subject, but there are shots in TITANIC, and set ups, ripped straight from Baker's film. Andrew standing in the sloping lounging staring at the clock, the rich dude slipping into the lifeboat -- and I know this stuff happened, but the way the crewman sees him, looks at him in disgust, and then turns his head and disdainfully gives the order to lower the boat...there's other stuff, too, and it all just seems WAY too specific for it not to be Cameron ripping of A NIGHT TO REMEMBER. Also, I remember Siskel & Ebert's review of TITANIC, and one of them, I think Ebert, praised the film for doing such a great job of making it clear and understandable how and why the Titanic sank. 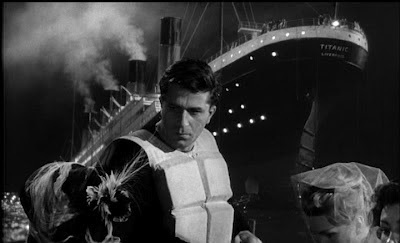 I'm not claiming Cameron ripped off Baker and Ambler here -- this really is just the same history fueling both movies -- but A NIGHT TO REMEMBER made the same thing just as clear and understandable in precisely the same way. 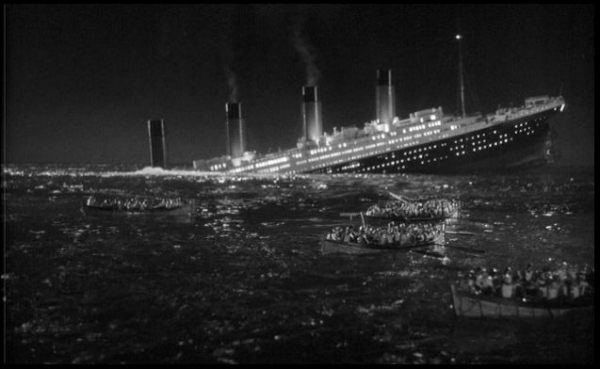 I just can't cut TITANIC much slack, despite the parts I liked. If they just released that "Nearer My God to Thee" bit on DVD, though, I might buy it. If Ebert said that implying it hadn't been done before, how stupid. Surely he's familiar with A Night to Remember. Maybe not. I mainly hate all the non-sinking stuff in Cameron's version and like all the sinking stuff. Nevertheless, A Night to Remember is the real deal, a meticulously crafted examination of the events without the love-story crap or the faux-epic feel (by faux, I mean, it's running time is the only thing it has in common with an actual epic. ).